What content works best? What’s the worst? This post covers a bit of both. Here are four things to put on your site and a few things to remove ASAP. Right now as you read this, someone, somewhere is researching your services. They’re looking for answers, deciding who to contact. 57% of buying decisions are made before the prospect contacts a salesperson. If your site doesn’t answer their top questions quickly, they will look for the answers somewhere else. It sounds simple, but it takes guts. Ask yourself, how many of these five questions are answered on your website? Marcus answered these questions on his site, and he’s attributed millions of dollars in sales to these pages. He has the analytics to prove it. 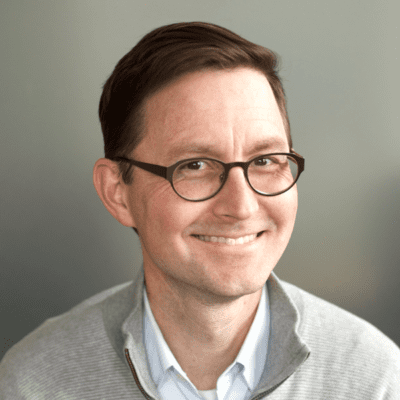 Those are the five most common questions, but what Marcus really wants is for us to listen to our audiences and answer their specific questions. If you have a search box on your site, then you have a tool for listening. 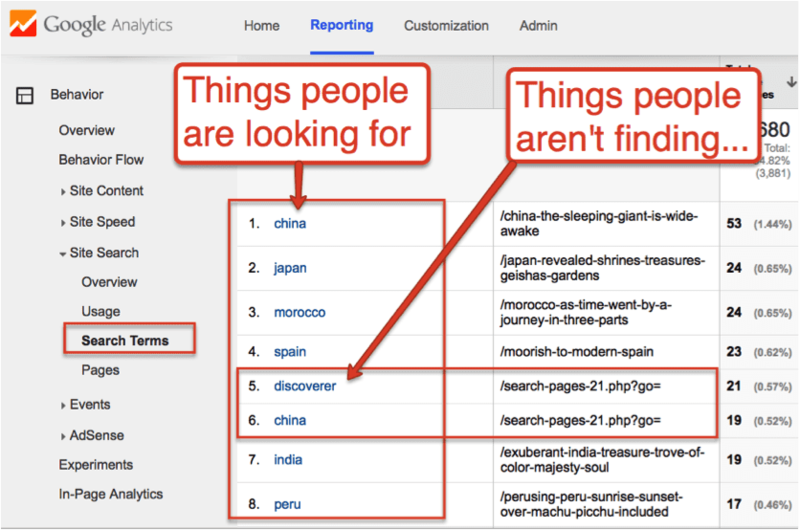 As long as Site Search is setup in Analytics, you can see what visitors are looking for. You can also see what visitors aren’t finding. We call this the “Report of Broken Dreams” because it shows the ways in which your site is unsatisfying to your visitors. Here’s how to check it. View Behavior > Site Search > Search Terms. Note: To get more data and more meaningful insights, choose a wide date range. Look for search terms that show the URL of the search results page as the exit page, such as /search-pages. If the exit page was the search results page, then the visitor did not find what they were looking for. Either your search tool is broken or your visitors are telling you something: put more of that information on your website. Here is the “Report of Broken Dreams” for a travel website, showing that visitors searching for “discoverer” are not finding what they’re looking for. Real photos. Not stock photos. The faces of the people that work there. Your people are unique to your company, so they’re a differentiator. Show them off by building up the team bios in the about section. There are benefits to both traffic and conversion. Search optimization: Websites often rank for the names of your team members, but only if there is a page for each person. It doesn’t work if there’s one page with everyone. Conversion rate: Put a name and a face on the site, and you build trust. Trust leads to phone calls, form submissions and sales. If you’re a small business, here’s where you have an advantage. You can be more personal, more human. Big companies are always trying to look small, and small businesses are always trying to look bigger. Really, all businesses should just be more human. Your site shouldn’t look abandoned. Put a face on it. Be a person. 4. Tell Your Passion Story! Why is your company in business? What is your purpose? What do you believe? What are you opposed to? What got you started? Why does this stuff matter? Your story lets people connect with you on a deeper level. It’s why they clicked “About.” So put your passion story on your website. Put it on the about page and if possible, use video. Now that you’ve put the good stuff on your site, time to get rid of the bad. Here are three things to NOT put on your site. Most website visitors scan pages, looking for relevant content. Long, blocky paragraphs get scanned or skipped entirely. Write short paragraphs if you want your content to be read. Testimonials are powerful social proof. But visitors tend not to go to testimonial pages. If you want your testimonials to be seen, sprinkle them throughout the site, on every page. (Here’s a complete guide on website testimonials with examples). It’s a container, but watch what you put in it. Fill it with things your audience wants and your visitors will reward you with low bounce rates and high time on site. Need help creating web content? Ask a content developer. Need more content ideas? Try answering these questions. I know it’s basic, but I used this tip to illustrate how much ineffective traffic our paid search provider is driving to our site. And also discovered there’s something offputting about how we communicate a product ID has changed because customers searching for those products exit the site at a much higher rate. If you’re paying for traffic, these lessons are even more important. If at all possible, don’t buy any traffic until you get these things on your site! Great advice, Andy. And a great post title that sucked me in! Thanks for sharing! Yes, that title includes all four of the four U’s: unique, useful, urgent and ultraspecific. It might be the first time I worked them all into one headline. It’s hard to do! Absolutely, Matt. Check the Report of Broken Dreams! This is a great point, Zack. As a general rule, the most visually prominent thing on the home page should be the shortest version of the value proposition possible. Yeah, by adding pictures of You and Your Team also helps to build trust and credibility. best example is mashable.com and moz.com about page. Thanks for writing it up. awesome. I always love your newsletters. Thanks, Andy. Thanks for dropping by and for the kind words, Pamela! good info but what is wrong with tesimontials? Nothing is wrong with testimonials. They’re excellent “social proof” and they’re great for your marketing! But people won’t see them if you put them all together on one page. It’s much better to get rid of that page and put testimonials throughout your site. Make every page a testimonials page, Damar! You hooked me with your title and I was not disappointed! Thank you for sharing great practical tips that my company can use right away! Yes, it’s kind of a click-baity headline, but I’m glad to hear that we lived up to it… Thanks for stopping by, Maria! Just thank you, thank you, thank you. We are about to revamp CWC’s website, and our Creative Director came to me the other day and quoted this article directly. We’ll be sprinkling the testimonials throughout! I’m glad this one was useful! Yes, put your testimonials everywhere. I’m sure you have a ton of them, Mare! Nice list. A honest user focused right to the point is always approach is always best. You have a limited time to make a first impression and sell yourself to a visitor. Very interesting topic and indeed good points to explore. #1 point is really important but I love the #2 point most. I am now thinking of adding a search section on one of our website and will see what our targeted customers are searching for so that we can create more useful contents on those topics. And adding team picture is an awesome idea and being a startup company, I am going to implement this tip ASAP on my business website. Thanks for sharing such helpful and unique tips. Excellent post! This can actually be used as a site audit tool – it’s that concise and specific. I understand what you’re saying about team member pictures but it scares me when I look in the mirror – I don’t want that to happen to potential customers! Great advice we will surely follow it. I like Tip 3.2 “get rid of testimonial page” and sprinkle them throughout the site. I’ve peppered my GMB 5 star reviews on my pages and that seems to work out well. Glad to hear it, Neil. That’s how it’s done! Get that good stuff out of the pages that people rarely visit and into the pages where they can help the most. We’re doing this for our site now. Ideally, every single page has a testimonial! Andy, you are the master! Love all your knowledge and truths! Any thoughts on pop-ups? The mantra has been, “people hate them, but they work.” Just read a post from one of the worst offenders who now says don’t use them. Though, he’s flip-flopped in the past.